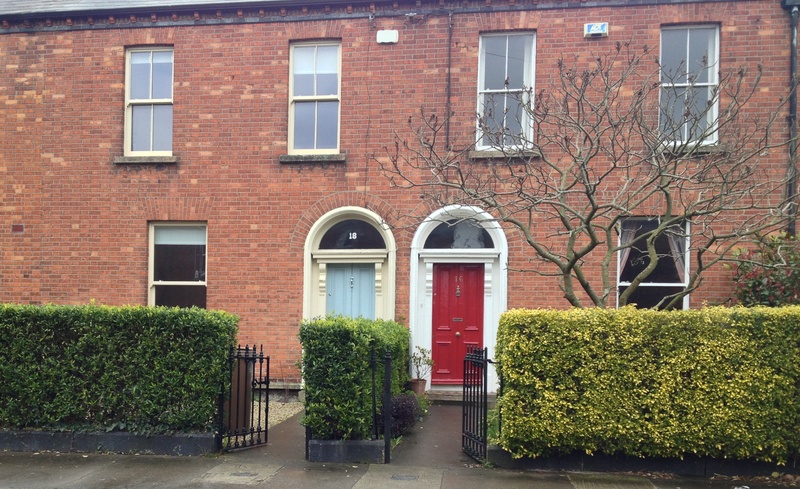 Last Thursday’s property pages in the Irish Times carried a rather overwrought piece about a house for sale in Ranelagh, a suburb of Dublin to the immediate south of the Grand Canal. The origins of the name Ranelagh are rather curious. It derives from the Irish “Gabhal Raghnaill”, an area of what became County Wicklow centered around Ballinacor. Until the early 17th century, this region was under the control of an especially truculent branch of the O’Byrne family; Fiach MacHugh O’Byrne who was mentioned here a few weeks ago (The Cosby Show, March 11th) and who the altogether more unassertive Irish Aesthete likes to claim as an ancestor, was known in the 16th century as Lord of Ranelagh. However, following the defeat of the O’Byrnes and the seizure of their lands, that title went to an interloper. In 1628 Sir Roger Jones, whose English-born father had been both Archbishop of Dublin and Lord Chancellor of Ireland, was ennobled as Viscount Ranelagh. In turn his son Richard was created Earl of Ranelagh in 1677. The latter’s London residence, immediately adjacent to Chelsea Hospital, was called Ranelagh House and some time after his death without a male heir the property was bought by a syndicate who converted the site into a fashionable spot called Ranelagh Gardens (the same ground now hosts the annual Chelsea Flower Show). So when in 1766 a Dublin entrepreneur called William Hollister decided to open a similar open-air place of entertainment on the outskirts of his native city, he chose to emulate London by naming it Ranelagh Gardens. Thus a name which had crossed the Irish Sea returned to its own country. Well-travelled readers will know there is also an area in Paris close to the Bois de Boulogne called Ranelagh. It too is named after the Earl of Ranelagh (the French were then more anglophile than later became the case) and was the site of the Château de la Muette where Louis XVI and Marie-Antoinette spent their first years of married life. It was from here that the Montgolfier brothers made their debut ascent in a hot air balloon in November 1783. Coincidentally the first Irishman to take off in a balloon, Richard Crosbie, did so from Dublin’s Ranelagh Gardens just fourteen months later in January 1785. 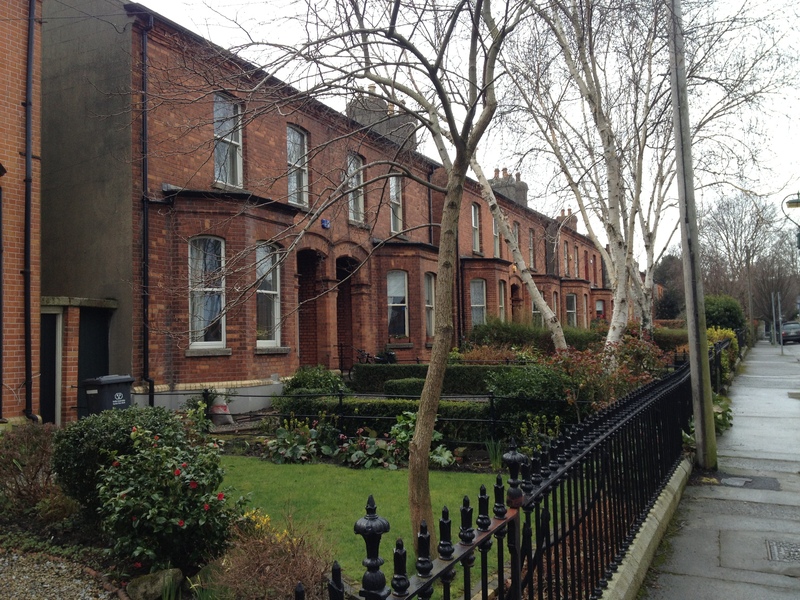 Dublin’s Ranelagh Gardens, like their London equivalent, eventually fell from public favour and the site came to be occupied by a convent of Carmelite nuns. They turned part of the grounds into a large kitchen garden that allowed them to be almost self-sufficient since they also kept poultry and even cattle. After the nuns departed in 1975 some of the site was retained as a public park and named Ranelagh Gardens, so retaining the link with the 18th century. Meanwhile the surrounding area had been gradually developed for housing as the city expanded and the prosperous classes moved out to what they judged the more salubrious suburbs. 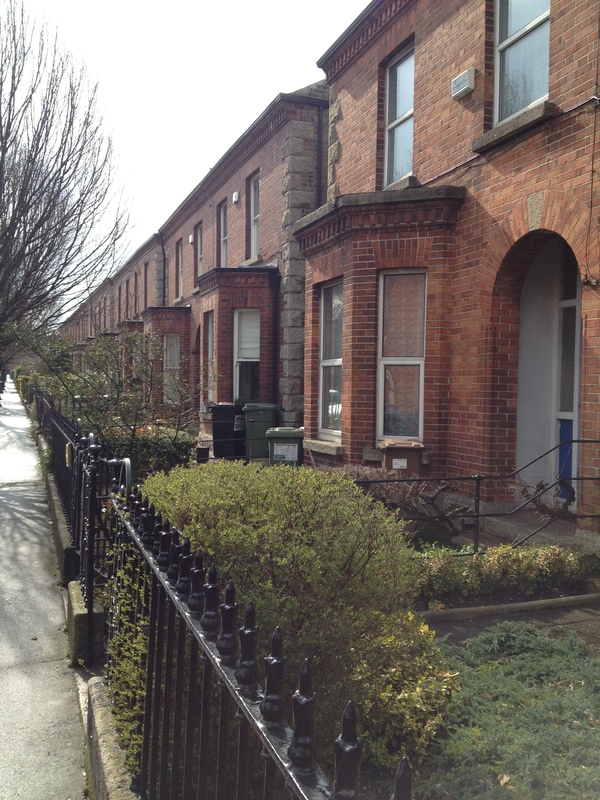 Ranelagh had the advantage of being outside and yet close to the commercial centre, allowing easy access especially after the advent of trams from 1872 onwards: many of Ranelagh’s red-brick terraces date from the decades immediately following the arrival of public transport. In the 18th century there were a few fine houses in the area surrounded by large gardens but inevitably these were lost as demand for development land rose. 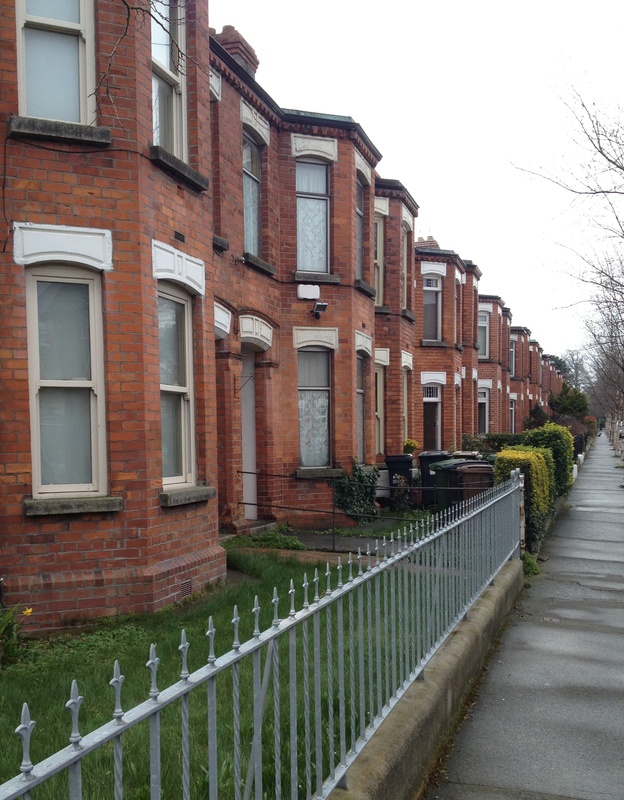 Despite the best efforts of the Irish Times writer, the resultant streets cannot claim much aesthetic merit. The houses are formulaic in style, all with the same narrow entrance halls opening onto two reception rooms before a short flight of steps descends to the kitchen with a door to the garden. A flight of stairs leads up to a couple of bedrooms, passing a bathroom en route. Built for the petite bourgeoisie, the Mr Pooters of Dublin, their design consciously avoided originality lest it frighten prospective buyers. Conformity was critical to their success. Maeve Brennan was born in Dublin in 1917 and at the age of five she and her family moved to Cherryfield Avenue, Ranelagh, a street immediately identifiable in the many short stories she would later write. Her parents were both republicans and at the time of her birth Robert Brennan had been in jail for leading the 1916 Rising in Wexford. In post-independence Ireland he became part of the new establishment and in 1934 was sent to the Washington as the Irish Free State’s first minister to the United States. Ten years later he returned to Dublin but his daughter Maeve remained, moving to New York where initially she worked for Harper’s Bazaar; it’s worth pointing out that at the time this was unquestionably the most influential women’s magazine in the world and had another Irishwoman as editor, the Dublin-born Carmel Snow. In 1949 Maeve Brennan was offered a staff job at The New Yorker where she remained for the rest of her writing career. Although she mostly produced social pieces under the title of The Long-Winded Lady, from 1950 onwards The New Yorker also carried her short stories, the best of which are set in Ranelagh. These tales, mostly featuring the same handful of characters although written decades apart, are as redolent of the world she had known in her youth as are James Joyce’s stories in Dubliners. In particular she possesses a remarkable ability to evoke sense of place; read her Irish stories (many of them collected together and published as The Springs of Affection in 1999) and you are immediately transported to Ranelagh. Maeve Brennan’s Ranelagh is not today’s self-consciously chichi “village” but an altogether more modest suburb of Dublin whose residents, as she makes plain, possess few ambitions other than to ensure their immediate neighbours remain unaware of the tempests brewing behind those glass-paned frontdoors. This is, of course, scarcely new territory but what sets her work apart is its ability to turn the mundane into the exceptional. Thanks to her adroit yet simple use of language, the regular red-brick terraces are filled with drama even while nothing remarkable takes place. Nobody is killed, or engages in adultery, or behaves violently or even shouts, but still those streets pulsate with passion. Maeve Brennan’s later years were not happy. The pall of melancholy that hangs over her stories spilled over into her life. In 1954 she married The New Yorker‘s managing editor St. Clair McKelway, an alcoholic womaniser with three divorces behind him. A few years later she became his fourth ex-wife. By the 1970s she had developed her own drink problem and by then also suffered from declining mental health which required hospitalisation on a number of occasions. Having lived in a series of rented apartments and hotel rooms over the previous decades, she now became homeless and took to sleeping in the women’s lavatory at The New Yorker‘s office. Destitute and unwell, eventually she was admitted to a nursing home and died in Brooklyn in November 1993 at the age of seventy-six. A few years after her death, Maeve Brennan’s stories were republished, leading to her discovery by a new readership; she has since been the subject of a biography and a play. While neither of these especially caught my fancy, I can recommend her Dublin short stories without reserve. No writer better conveys the spirit of the city in the aftermath of independence and in particular the character of Dublin’s then-burgeoning suburbs. 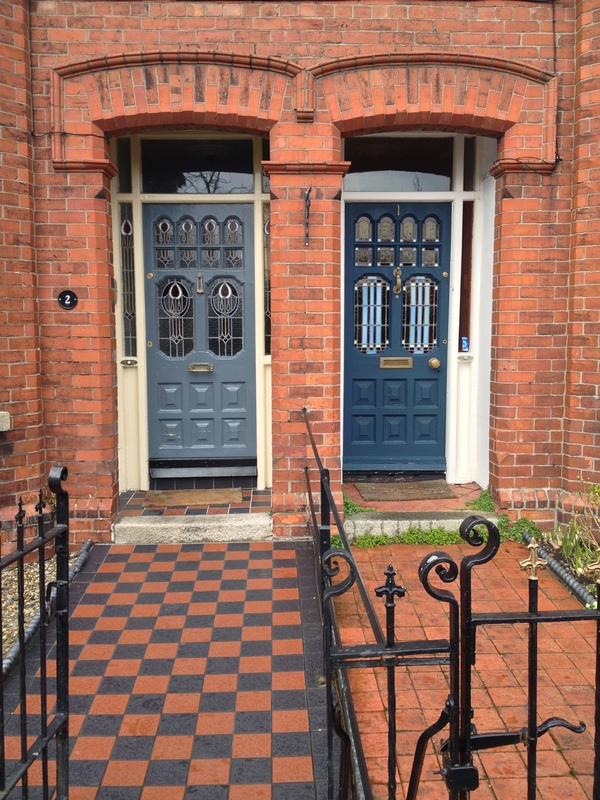 Thanks to Maeve Brennan attributes hitherto hidden become apparent and the seemingly ordinary streets of Ranelagh appear beautiful. This is the transformative power of great prose. This entry was posted in Architectural History, Book, Dublin, Irish Person of Note and tagged Architectural History, Dublin, Irish Character, Maeve Brennan. I wish you had been my English teacher. I reckon that if you were writing the ‘blurb’ for an estate agent, they’d sell every damn property on their books. I have only visited Dublin once. I happened to be at a loose end in Angola and an Irish Charity headquartered in Dublin, the nurses of which I was chasing, asked me if I could help them out with a mine pollution problem at a hospital in the interior (N’Dalatando) but. like all charities, they were strapped for cash. Apparently all the hospital grounds and approaches had been mined and they had lost a number of patients, I told them that I would work for whisky and cigarettes and a meal a day. By hand I cleared what would become safe areas and approaches of mines and the dangerous detritus of war. It was fast approaching Christmas and some of the workers were due home on leave. ‘Kitty O’Shea’s’ they said, ‘4th of January, be there or be square’. With the whole of the Angolan administration shutting down for the holidays, I realised I had the window of opportunity to surprise my new Irish friends by actually turning up. Trouble was, in those days, flights were limited and every seat on any aircraft heading north or to South Africa, another regional hub, were booked solid. So I flew to Moçambique. All the major carriers operating out of Maputo were also fully booked so I flew in a light aircraft to Nelspruit in South Africa. From there I took another light aircraft to Johannesburg (still called Jan Smuts International in those days), still no luck. So I flew to Cape Town, always conscious that I was heading in the wrong direction. There I managed to get a seat on an Indian Airlines flight that had been on its way to London but had been diverted to Cape Town celebrating the New Year somewhere over the Equator. I had been travelling 96 hours by that stage so checked into my club near Marble Arch so that I could swab my stinking body, get some food down my neck and a bit of sleep before nipping down Oxford Street for a change of clothes. Then I hired a car, drove across the country to catch a ferry to ireland. I can no longer remember the name of the hotel I stayed in but it was a magnificent old building on the same boulevard as the ‘Floozy in the Jacuzzi’. After Angola and tired as I was, a straw mattress in a lean to round the back of a council estate would have served. On the 4th of January I walked into Kitty O’Sheas. I don’t remember much after that other than an animated conversation with a bunch of solid looking men who one of the nurses quietly and urgently warned me were Republicans. One of them told me they had specifically targeted bomb disposal officers. Having buried a number of my colleagues, I was well aware of that but, as I contested, we were targets that could under the circumstances be argued as legitimate as we were in uniform, whereas civilians could in no way be categorized as such. We agreed to differ in the interests of a jolly good piss up. The next day I visited the headquarters of the aid agency and was taken to a fantastic old pub for lunch. It still had the divided off compartments for clients to sit in and served not only an amazing pint but solid food, exactly what I needed. Being a bit of a peanut bladder, pretty soon I needed to make a trip. In the tropics, we sweat out our excess moisture. In the freezing environment of a Dublin January, there was only one way to get rid of it, frequent trips to the loo. The passageway and the bog walls themselves were lined with sepia tinted photographs of the Heroes of the Revolution all of them captioned with, ‘Name, Murdered by the British, Date’. Bursting bladder and all, I looked at every single one. Goodness. The British must have been very busy in the Twenties to have lined the corridor and the Gent’s loo of a Dublin pub with photos rather than wallpaper. Don’t forget, this was my first taste of civilization after experiencing the civil wars in Moçambique and Angola and I was still doing the same job as I had done in Northern Ireland, trying to stop civvies getting blown up. Many pints of Kilkenny had done wonders for my kidney stones but, after my experience on three continents, I was still bemused how communities could slaughter each other almost with gay abandon although, to be fair, I was more shocked in Sarajevo. I liked Dublin. I was supposed to go on to Germany after the piss up and meet with my family. Instead I walked the streets of Dublin. My German grandfather, and his father before him, were architects and designed many of the notable buildings in Berlin. My Grandfather was part of the team of architects who designed the Mercedes factory in Sindelfingen near Stuttgart where my brother, a civil engineer, still lives. My Great Grandfather helped design KaDeWe, a diminutive of Kauf Haus Des Westens, for a long time the largest department store in the world. You should see the central stair case and columns. There are some fabulous buildings in Dublin, products of very fertile minds. Some are spectacular expressions of their epoch. Others are humble yet well designed estates. After so long in Africa my blood was as thin as whiskey and I was freezing my nuts off. I even bought a leather donkey jacket in a futile effort to be warm but I could have walked those streets for weeks. Even the lamp posts were works of art. Sadly, there was a war on in Angola and I was under contract so I had to go back. As I left, the fields of Ireland never looked so green. I thoroughly enjoyed reading this article yours. I don’t think I was cut out to be a teacher of any sort: I would have been as ineffectual as Paul Pennyfeather in Decline and Fall. But thank you for the compliment. I used to know Kitty O’Shea’s – about twenty years ago when I had a house not far away but it has been a long time since I was in any of the old Dublin pubs; not really the sort of place I frequent any more. Still I’m happy to hear your one and only visit to the city left such a lasting impression….